Arriving back into the UK after the Addidas Rockstars event I suffered a momentary lapse in memory at the passport control desk. It was in a similar frame of mind that I sat at Manchester Airport again on Friday morning, a sense of déja vu creeping in. 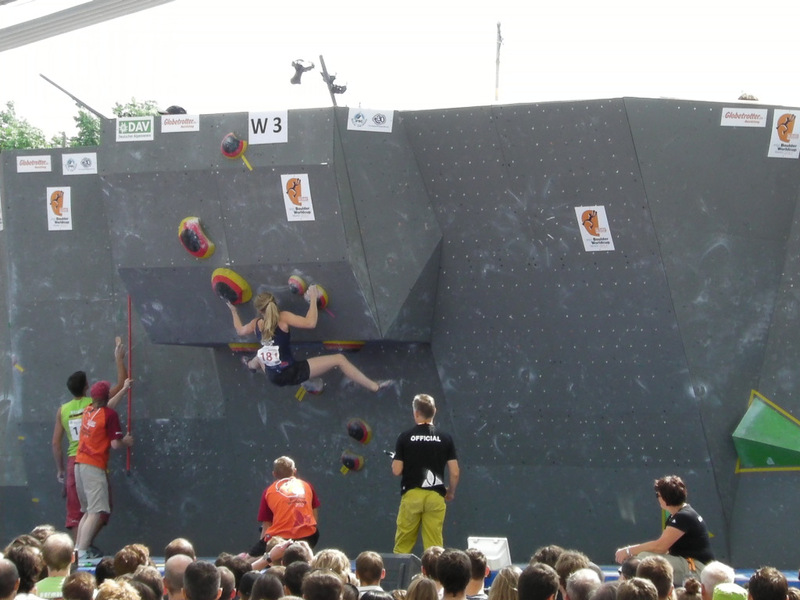 This time I was on my way to Munich for the last IFSC Boulder World Cup. I was excited. The Addidas event had improved my confidence so much and I felt it was possible to do well again. I was aware that there were more competitors here and some strong women present that hadn’t been in Stuttgart but still; in my mind I was up there with a chance, a strong competitor in the field. It sounds silly but this kind of thinking is new to me and so marks a change. The qualifiers came around and I was out 19th. This means a fair bit of time in isolation but nothing to complain about. There were 51 women so to be out last meant over 3 hours in isolation. I was nervous but flashed the first boulder, which instantly settled my nerves a bit. In the transition zone it is impossible not to notice how quickly people come back from the wall and therefore get an idea of whether the problems are getting done or not. There was a mix. I flashed the second boulder and my confidence grew. When I stepped onto the mat in front of the third boulder I didn’t know how to climb it. There seemed to be lots of options but it looked as if it were set to be a dyno. I pulled on and jumped, latching the first and second hold and stopping to my surprise. I finished the bloc, my third flash. This problem pleased me the most as jumping always used to be one of my real weak points. It is very satisfying when, through practice and training, a weak point can become a strong point. The fourth bloc was a little more tricky and took me 4 goes (with one silly fall from the top!). The last bloc was the hardest I think but with a bit of luck and grimacing I found my way to the top first go. So I had done all 5 blocs. That had never happened before. I was really happy. I went into the semi finals in joint 5th place. This is the highest I have ever placed in a IFSC World Cup round. The GB Team as a whole did brilliantly. All 8 of us placed in the top 30, with 5 making the semi-finals. In good spirits on Sunday morning, Katy Whittaker, Ned Feehally, Stew Watson, Adam Watson and I went into isolation once more. Problem 1, Semi Finals. Photo Diane Merrick. I felt good again. I was hoping I could keep my lucky streak going and I wanted to make my first World Cup final. It was possible and I still believe now that I am capable of it. It wasn’t to be on this occasion though, I fell too many times and I didn’t top enough. The combination of some mistakes and some shortcomings meant that I wasn’t even close. I’ll be honest and say I was disappointed with 15th place. In the past that would have been a great result for me but I feel I am capable of more now. However, in a roundabout way that is pretty cool. Six months ago I would never have dreamt that I would be disappointed not to make finals, they weren’t even on my radar. That is what I choose to take from this: potential, confidence and psyche. Problem 3, Semi Finals. Photo Diane Merrick. It was a great trip as a team, lots of fun. 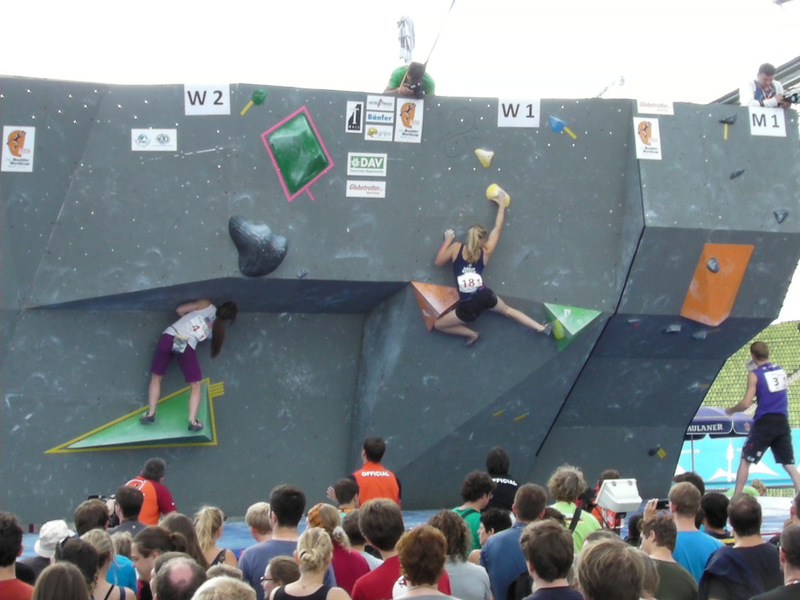 The finals were amazing to watch, really cool looking blocs and some impressive climbing as usual. Shauna also came along on her crutches and we got to watch her receive her trophy for overall 3rd place for 2012. A great result and well deserved. It was hard for her, watching and not being able to compete but she was a brilliant support to the rest of us. 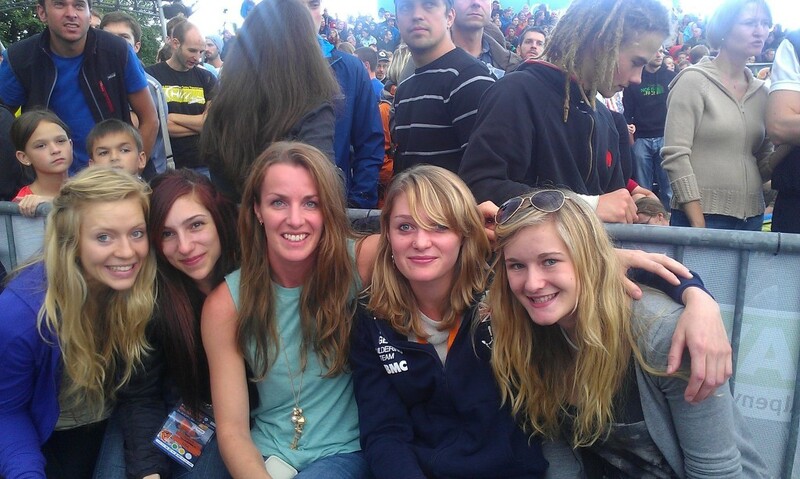 Me, Alex, Gill, Katy and Shauna watching the finals. I regret to say I will not be competing at the World Championships in Paris this year. I am disappointed not to be going, especially because I seem to have found my mojo (for want of a better phrase…). I have started to really enjoy the competitions more and so naturally I want to keep going. I will be at my sister’s wedding that weekend, which I wouldn’t miss for the world and from there I will be willing on my team mates. I am sad that my season is over at this point but I look forward to competing again next year. One more competition left though, I still have The Battle in Norway on the 8th September….